You'll be £12.00 closer to your next £10.00 credit when you purchase Kent at War 1939–45. What's this? Order within the next 10 minutes to get your order processed the next working day! 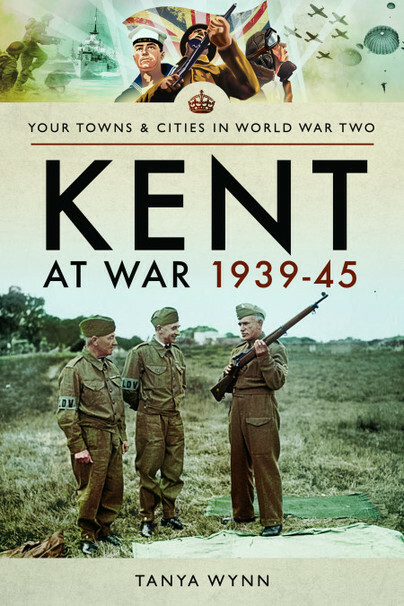 Kent at War 1939 - 45 is a comprehensive account of the part that the county played in the Second World War, covering in great detail a combination of life on the home front from a civilian perspective balanced against that of a military one. The book's narrative looks at the part played by the Dover Patrol in keeping Allied shipping safe in the English Channel, not to mention the preparation and the aftermath of the Dunkirk evacuations in May 1940, with all of the vessels leaving from and returning to Kent ports and harbours. Other topics covered include the part played by the numerous Kent airfields during the Battle of Britain between July and October 1940, and the Richborough camp, which was set up in 1939 at the old First World War Kitchener barracks. Here Jewish men who had escaped from such countries as Germany and Austria, were put up as refugees, and the book includes never before published letters written to one of the camps residents during his stay there. The author also discusses the county's military hospitals, Belgium refugees, as well as the restricted military areas that adorned the Kent coast line, as the people of Kent battened down the hatches knowing full well that not only were they on the front line of attack, but the very first line of defence in the case of a German invasion. I felt the text did a very good job detailing what life was like in the period and Kent’s great series of contributions to the English war effort in a style which was a great paced read and kept one fully engaged. I would highly recommend this book and feel it may be setting a new standard for the series as well. A good companion text in this series is Stone’s Soviet Union at War. Whatever your knowledge of what happened in Kent in the period 1939 to 1945 I am sure that you will learn something new. I certainly enjoyed the read and to learning a little more about operation Pluto.